The content on this website is a record of the experiences and teaching methods of piano teacher Jan Hazell – it consists of her personal views and opinions. Any content on this site is for reference only. All the information on TeachPianoatHome.com is published in good faith and for general information purposes only. The site owner does not make any warranties about the completeness, reliability and accuracy of this information. Any action you take upon the information on this website is strictly at your own risk and the owner will not be liable for any losses and damages in connection with the use of the website. You can visit other websites from this site by following hyperlinks to these sites. While this website strives to provide only links to useful, professional and ethical websites, the owner has no control over the content and nature of these sites and the links to other websites do not imply a recommendation for all the content found on these sites. Please also be aware that when you leave this website, other sites may have different privacy policies and terms which are beyond our control. Reasonable efforts are taken to ensure the accuracy and integrity of information and related materials provided on this site, but TeachPianoatHome.com is not to be held responsible for misprints, out-of-date information, technical, typographical or other errors appearing on the website. The information on TeachPianoatHome.com does not in any way constitute legal or professional advice and the site cannot be held liable for actions arising from its use. Under no circumstances shall TeachPianoatHome.com be liable to you or any third party for any misrepresentation, loss or injury or any direct, indirect, incidental, consequential, special, punitive or similar damages arising out of your access or use of, or your inability to access or use, this site and the information available on this site or arising out of any action taken in response to or as a result of any information available on this site. Reference within this site to any specific commercial or non-commercial product, process, or service by trade name, trademark, manufacturer or otherwise does not constitute or imply an endorsement, recommendation, or favouring by TeachPianoatHome.com. 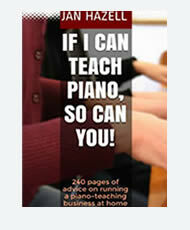 References to books, software, websites or products as ‘Recommended by TeachPianoatHome.com’ are suggestions only and do not necessarily constitute or imply an endorsement. The owner of TeachPianoatHome.com is pleased to be able to provide all content on this site free of charge to visitors. The site is an affiliate partner with various third-party merchants and the owner will often receive a referral commision when a reader clicks through a link to one of these merchant’s sites and goes on to make a purchase. Your support in purchasing through these links assists the owner of TeachPianoatHome.com with the costs of maintaining, updating, hosting and creating new content for this site. TeachPianoatHome.com welcomes and encourages readers to comment and participate in respectful conversation about the content posted here. All comments are moderated and the site owner has the right to edit, shorten, move or delete any comment at any time to keep comment within policy guidelines. Any comments which the site owner deems to be spam, abusive, inappropriate language, profane or rude will be deleted. TeachPianoatHome.com disclaims any and all responsibility or liability for the accuracy, content, completeness, legality and reliability of the content submitted by visitors to the site in comments on posts and pages. The opinions expressed by readers providing comments on this site are theirs alone, and do not necessarily reflect the views or opinions of the owner of TeachPianoatHome.com. Please do not post full articles or publications from other sites, as it could be a violation of copyright or intellectual property laws.